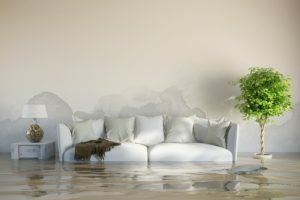 Water damage from frozen plumbing pipes, ruptured water lines, and dripping water heaters or washer hoses costs homeowners billions of dollars every year. You could leave only to return to find it a completely flooded home or business. These types of problems can be avoided by taking a few precautionary measures before you leave for any extended holiday travel. If you are going out of town for any length of time, it’s important to remember to turn your water off. Shut off the main valve that controls the water supply to your entire home during these cold months of winter to avoid the possibility of water damage. You should turn it off whenever you are going to be gone overnight. The water meter should be near your main water supply, sometimes attached to an exterior wall or in an underground box with a removable lid that lifts off easily, sometimes in the basement or utility room. Turn off the indoor water supply valves for all appliances that use water – dishwashers, washers, and icemakers. Individual shutoff valves are installed on the supply lines leading to most appliances as well as to toilets and faucets. Typically the valve stops have a small oval handle that you turn clockwise to shut off the water. The shutoff to your refrigerator’s icemaker might be located under the sink or in the basement. If you have a well you can shut off the electrical switch so it won’t pump any water while you’re gone. Check that the sump pump is in good working order before a vacation away, as well. You can test your sump pump by filling the sump pit with water and making sure the pump is actually pumping out the water. If it doesn’t, be sure the sump pump is plugged in, and check the breaker as well. Make sure the outlet pipe isn’t frozen or clogged and that it directs water away from your home. Clean the hole in the discharge line and check that the motor is running smoothly. Adding a backup battery to your sump pump so that it functions during power outages would be a good idea, too – water in the basement seems to go hand-in-hand with heavy rainstorms. Homeowners should periodically inspect the various hoses that supply water to machines and equipment. It only takes a few minutes to inspect all the water lines in your home. Rubber or plastic hoses become brittle and can leak or even break as they age. If they are eroded with mineral build up or cracked and damaged in any way, it is time to have them replaced. New hoses such as the stainless steel braided type last longer than rubber or plastic hoses and are less likely to leak. If you’re replacing hoses, inspect the shutoff valves, too, and if there are signs of wear, replace them too before leaving for an extended time. The small cost incurred with replacement will be nothing compared to the expense of repairs from water damage due to cracked and damaged water supply lines. The outside of your home should be inspected for potential risks of water damage, especially the guttering and downspouts. If the lead troughs are full of leaves and debris it can cause water seepage that will damage your siding and inside walls. Downspouts should be placed strategically to direct water away from the foundation, at least 10 feet. If it doesn’t you can add extensions. Disconnect garden hoses and make sure outside spigots are turned off. And lastly, turn the furnace down to 60 degrees when you leave. Avoiding frozen inside plumbing is best done by taking the steps necessary to protect your home; by adjusting the heat you’re going to save on utility bills, while still protecting your home from any repair bill due to water damage while you are gone. AAS Restoration repairs homes from water damage in Kansas City. 816-861-1550, https://www.aasrestoration.com/.